Coleraine FC WILL BE wearing their traditional blue and white colours when they take on Linfield in the Irish Cup final on May 6th. The club has launched a special bespoke kit, which features a white top, blue shorts and white socks, harking back to the Bannsiders’ early beginnings when they were known as The Lilywhites because of their all white kit. So it would be quite fitting if the club could go on and secure some silverware in this its 90th year. “Blue and white has been synonymous with Coleraine for years,” said boss Oran Kearney. “The kit looks fantastic, and with a bit of sun in the final the brilliant, bright white will look very special. “It’s one which I think fans will want to purchase because of the look of it, I would certainly get one as it has such a striking look. Kearney explained the thinking about the change of kit for the big day. “We had to make sure we did whatever we could to be wearing blue and white on cup final day. “Whenever we lost the toss for the kit we knew then we would have to wear a change strip. 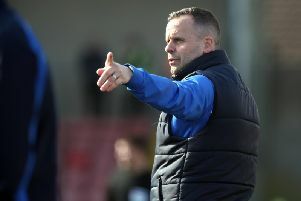 “I said to the chairman I wanted us to be in blue and white, and with what Linfield will be wearing we have been able to come up with a very striking kit in our colours. “We like our away kit, we have had good results in it, so it’s not superstitious, but on final day everyone goes wearing their club colours. “Our fans will be decked out in blue and white scarves, wigs, face paint, everything would be blue and white and the players would be the only ones in red and black. “That didn’t sit right with us, so we got on to Joma and thankfully they were able to help us out with that. Fans will be able to purchase the Cup final top at next Saturday’s final league game at home to Ballymena United. The top is priced £50 and will be available on a first come first served basis - no reservations or booking. It will be on sale from the club shop from 1.30pm on Saturday 29th April.